Are you paying your credit card bills every month, but you can’t seem to pay down the balances as quickly as you’d like? You’re not alone. The average U.S. household has more than $15,000 in credit card debt1. That’s a lot of money sitting on cards that may have high interest rates, plus a variety of due dates that can be tricky to pay off. If you’re struggling with credit card debt or are looking to pay it off faster, a personal loan can be a great solution because they may offer lower interest rates, finite repayment terms and sometimes a lower monthly payment. One of the easiest ways to see the money math at work is to use a Debt Consolidation Calculator. It can show you how, through a personal loan, you can pay off existing balances – sometimes quicker and with less interest than if you were to pay each bill individually. And who doesn’t like the prospect of saving time and money? Let’s look at the benefits you may see with a personal loan and get an idea of what you might save with debt consolidation. Credit cards can have high rates and many may significantly increase your interest rate if you miss a payment. Last year, the average penalty interest rate of a credit card with a payment 60 days late was 28.45%2, according to a CreditCards.com survey. That increased rate can lead to hundreds of extra dollars in interest payments each year. There are three reasons why using a personal loan can be a smart way to pay off debt by combining all of your balances from higher-interest rate credit cards into a single bill. You can pay off your credit card balances with a personal loan that may carry a lower interest rate. A lower interest rate could save you money by lowering your monthly payment. You could also continue to pay the same amount every month and potentially pay down your personal loan faster. It’s important to remember that you shouldn’t consolidate unless the personal loan provides you with a lower annual percentage rate. It can be hard to keep up with bills, especially if you have multiple credit cards that each have a different payment due date. Consolidating all of those balances into a single payment can help alleviate the burden of debt, and maybe quicker than you think. It is often easier for most of us to focus on paying a single bill. It’s also easier to control the rest of your budget with just that single deduction from your checking account, making it even simpler to save with debt consolidation. Some personal loan providers allow you to set the date of your monthly payment, which allows you to pay on a day that’s convenient for you. Let’s break the math down a little further. 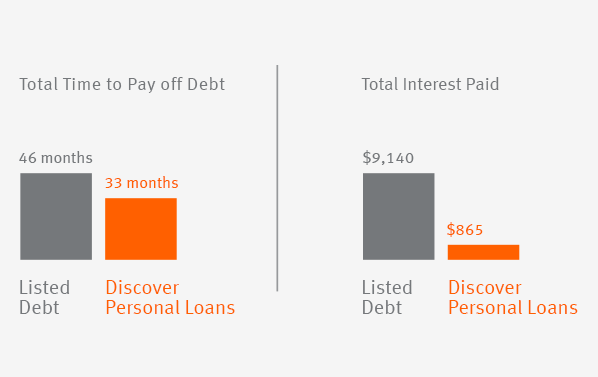 A Discover Personal Loan has an APR between 6.99% and 24.99%. Balances paid off 13 months faster: 33 months instead of 46. Total interest paid would reduce to $865, an estimated savings of $8,275. Figure 1: Savings based on sample calculator at 6.99% APR. It’s great that you want to take control of your finances. Researching information to understand your best options is a good first step to becoming debt-free. Every day thousands of Americans like you decide that paying off their credit cards with a personal loan is a great financial move. Using a personal loan may help you save with debt consolidation and help you pay off your balances faster. In addition, personal loans are unsecured so you don’t risk putting your home or other assets up as collateral. If you decide a personal loan is right for you, consider a trusted lender. Discover Personal Loans is a great place to start.